The Inman Aligner is a great new treatment that can boost the confidence you have in your smile in around just 8-16 weeks. It’s removable, fast and represents a totally new concept in cosmetic dentistry. It will straighten your natural teeth with less hassle and expense in a shorter period of time than any other orthodontic treatment. And because the treatment times are shorter, it also costs far less than a traditional brace! The before and after pictures below show just what can be achieved in as little as 10 weeks. The treatment shown took one third of the time that a conventional bracket and wire treatment would have taken and cost the patient half the price. How does the aligner compare with older, more traditional treatments? The Inman Aligner usually does away with the need for crowns or veneers altogether The Inman Aligner is incredibly safe and involves fewer risks than veneers and crowns. Why is it faster than treatments with traditional braces? Because the Inman Aligner’s job is solely to straighten the smile at the front of your mouth, rather than improving your bite, the treatment times can be reduced to as little as 8 to 16 weeks. We have found that treatment with an Inman Aligner can cause some initial discomfort to the patient in the first 3-7 days. However, the level of discomfort is very similar to that experienced by patients who have been fitted with a traditional wire and bracket brace. How visible is the Inman Aligner. While the device is still visible, it is less visible than a conventional brace. But the Inman Aligner is removable, and if you need to take it out for a special occasions, you can. After an initial short free consultation to find out whether the Inman Aligner is the right treatment for you, we carry out a detailed consultation, where we listen to what your goals are for your smile and then look thoroughly at your teeth, gums, jaws, jaw joints, and bite. In order to plan your treatment we take Impressions and photographs of your teeth and use them to simulate your tooth movements in the laboratory. We construct a bespoke Inman Aligner that is programmed just for you. The Inman Aligner is easy to insert and remove. It works much faster than alternative orthodontic techniques, so most patients wear their Aligner for a period of 9-16 weeks. Because it is removable, the device can be taken out for important meetings, photographs, cleaning and social events. Ideally the device should be worn for 20 hours a day, but if you don’t manage a full 20 hours it just means that treatment will take a little more time. We review progress every 2 – 4 weeks to keep your treatment on track and to ensure sure you get to the desired result in as little time as possible. The last step is in some ways the most important. To maintain your smile in its new improved position you need to hold the teeth in place. 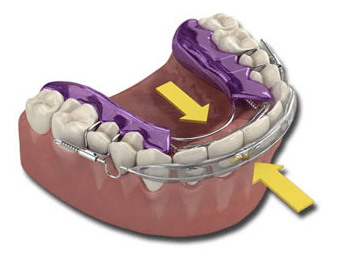 This can be achieved either using a clear snap in retainer that is worn at night, or by gluing a retainer behind the teeth where it will not be seen but will support them in their new position. An initial appointment to discuss the stages involved in treatment and assess your suitability is being offered free of charge at Winning Smiles this summer. Winning Smiles have 15 years’ experience in private adult orthodontic work. We only use tried and tested treatment methods and always put the health of your teeth at the heart of every decision we make. If you would like to know more about the Inman Aligner and find out whether its the right treatment for you, please call us to speak to one of our staff or book a short consultation. And it’s currently free! To spread the cost, payment plans are available for this type of brace system, although a deposit is required for the cost of the brace, and terms and conditions do apply. Alternatively, our traditional braces system is available from £125 per month. The following costs for The Inman Aligner are correct when written, but they can change. We will provide written pricing for each ‘cosmetic treatment’ as part of our free consultation.You don’t have to be a member to have treatment at Winning Smiles.